For years, Denver's 14th Street languished as an uninviting stretch on the west side of downtown, comprised mainly of blank cement walls, lonely bus stops and an occasional landmark facility. That began to change when the Colorado Convention Center on 14th Street underwent a major expansion in 2004. As marquee hotels moved into the area, dealing with 14th Street's lack of ambiance became a priority. 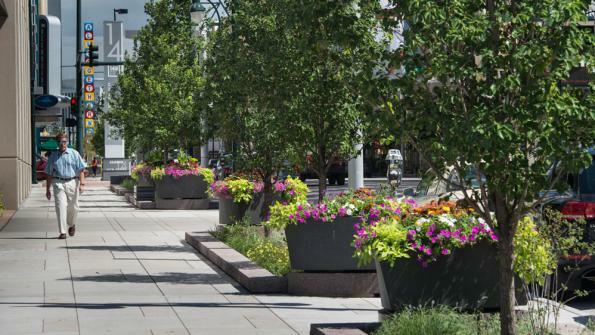 Consequently, 14th Street was slated for the most significant streetscaping project in downtown Denver since the 1982 opening of the 16th Street Pedestrian Mall. The 14th Street improvements, completed at the end of 2011, include expanded sidewalks, a dedicated bike lane, street corner bulb-outs, improved pedestrian lighting, bike racks, benches, landscaping, and way-finding monument signs with lighting, information and directions. The project was funded and implemented through a public-private partnership between the city and county of Denver, the Downtown Denver Partnership, the Downtown Denver Business Improvement District and 14th Street property owners. The cost totaled $14 million, with $10 million funded by the Better Denver Bond Program and $4 million by 14th Street property owners through the formation of the 14th Street General Improvement District. Because 14th Street provides a first impression for people visiting the Colorado Convention Center, hotels and theater district, locally-based Arthouse Design developed a campaign branding the street as an "ambassador" to the area. The firm also developed a 14th Street logo, directional and informational banners and signs, and a series of dramatic 22-foot-high kiosks that include signs, lighting and directions to downtown Denver landmarks. Good news for Denver. I would like to know more about the success of this and other streetscape/corridor revitalization undertakings by cities.